Ever wonder what goes into the dinnerware that you serve your food on? How about the foam containers your takeout gets sent home in? It's important to many restaurants, delis and other food service businesses to be aware of what materials they are sending out the door with their food. At Genpak we understand this, and provide detailed information on the materials used to engineer our quality food containers and packaging. Compostable and biodegradable products are becoming more and more popular in every industry, and the food container and packaging industry is no exception. That's why we are proud to offer a variety of Harvest® lines for your food serving needs. There are cups from materials harvested from managed forests; microwave safe containers manufactured from renewable resources; and plastic knives, forks and spoons consisting of 60% annually renewable starches. Most of your food container and packaging needs can be met just with our environmentally preferable products. Learn more about these materials here. We also offer our cups, plates, dinnerware and food packaging in a variety of traditional materials. From the versatile foamed polystyrene to solid plastics like APET and CPET, we engineer our products to not only showcase your food brilliantly, but also to stand up to the applications that you will put them through (like warming stations). Take a few minutes to learn about all the foam and plastic food containers made from traditional materials. If you have any questions on any of the materials used in our products, please call us at 800-626-6695 or send us a note. We look forward to partnering with you for all your foam, plastic and other food packaging and container needs. Probably the most versatile of substrates, foamed polystyrene may be made into a multitude of shapes and configurations. It has excellent insulation properties and decent thermal resistance making it applicable for both hot and cold foods. Hot foods will stay hot longer and cold foods will stay cold longer in a foamed PS container. Foamed polystyrene also takes very little energy to produce compared to other substrates and consumes virtually no water during production. It is also extremely light weight compared to nearly every other material which means it uses far less raw materials. As with many food packaging items, very few facilities exists for recycling, but recently there has been a surge in centers collecting this material. Check with your local municipality to see if a site exists near you. This type of polystyrene material is, for the most part, foamed polystyrene without the "foamed" part. It is well known for begin formed into plates and bowls. The kind you see sold at the grocery store. It has excellent cut resistance and can handle very heavy applications such as complete meals. Although not as light as foamed PS, solid PS is still lighter than most other materials making it a very economical choice for a wide range of food packaging applications. PET is a solid plastic material most often used to produce water and soda bottles. At Genpak, we specialize in two types of PET. APET & CPET. APET is a crystal clear material and is an excellent choice when displaying food items. APET may also be used in cold and frozen applications as well and will hold up in automated fill/seal process lines. 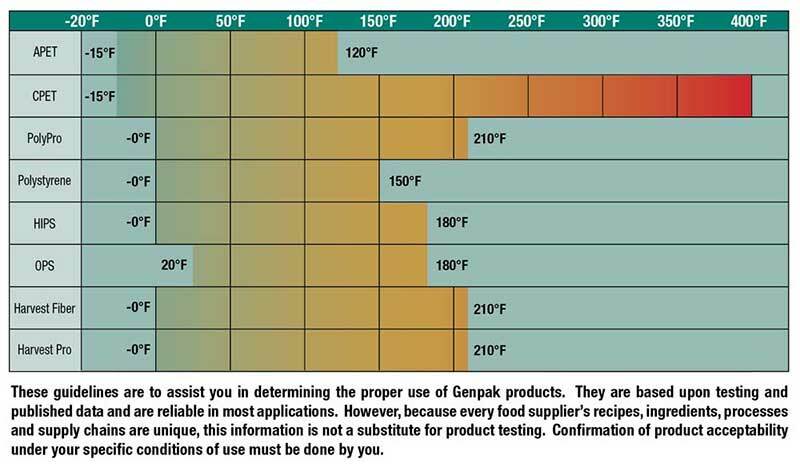 CPET is another form of PET that when crystallized, becomes able to withstand very high temperatures making it perfect for oven ready applications. We offer a wide range of oven ready bakery and food trays in this material. Great care must be taken when using these products in the oven and we offer a Use & Handling sheet that can guide you through. Both APET and CPET are #1 recyclable material and at Genpak, we manufacture all of our APET items with 30% post consumer recycled content making it very attractive to customers looking for a "green" profile in their food packaging. When microwave safe options are required for food packaging, polypropylene is the best choice of materials. We can produce PP in clear and in colors such as black and white. We are also the only company to offer a unique textured PP material that allows us to produced products that are up to 20% lighter in weight than most other competitive items, without sacrificing strength or functionality. This translates into much less raw materials being used and lower product cost to our customers. This hybrid material contains 60% polypropylene and 40% natural minerals such as talc, that provides an enhanced "source reduced" environmental message. Harvest Pro products have the look and feel of traditional top-of-the-line plastic products and are completely microwave safe. These features provide for a very wide range of food packaging applications. Our paper cone, portion and drink cups are produced from raw materials originating from forests managed with Sustainable Forestry Practices and are all compostable. All of our Harvest Paper product configurations are engineered for maximum strength and durability utilizing box pleats, concave surface areas and rolled rims. Genpak Harvest Fiber material is manufactured from renewable resources and is 100% compostable. The base fiber material for all of our products is bagasse, which is a byproduct of the sugar industry. Harvest Fiber products are microwave safe and grease & water resistant. Each item is engineered with ease of use in mind.